I originally requested this as an ARC from Netgalley, because I enjoyed Helen Castor’s She-Wolves, but I never got round to it in time and ended up buying the book recently. This is a bit too dry to be a story, but Castor certainly “pick[ed her] way through the evidence, choosing what to weave into a seamless story”. It doesn’t spend much time in the narrative on talking about conflicting testimony, apocryphal stories, etc — I’m left not quite sure how sure Castor is about some of the events she describes. The notes are pretty extensive though, with plenty of references for anyone with the patience to follow up on it. 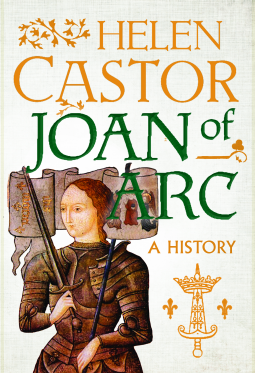 As with She-Wolves, this is a pretty readable book, and Castor manages to bring across Joan’s indomitable spirit, her conviction, and, yeah, her sassiness. From the records we have, it seems that we have a pretty consistent picture of Joan as a pious girl who believed wholly in what she was doing, and that she was heaven-sent to fulfil her mission. One thing I wondered, though — would we treat her any better today? People talk about how badly she was treated, particularly when in Anglo-French custody but also in the endless requests to prove herself and her virginity. But we’d treat her as mad today, not venerate her. Mind you don’t take Joan the hero and act ‘holier than thou’ about the medieval people who condemned her. You likely would too, though for different reasons, however pretty and sassy and self-confident she was.